It’s been a long time since a Back of the Ferry induction, but last night we had two visitors from Melbourne on board who have heard about the unique combination of the acquatic and alcoholic that the Manly Ferry provides and were as keen as mustard to join the ranks. The boys’s night out in Manly will be separately covered. Cam has been instrumental in some great nights out in Melbourne, including arranging BotF’s meeting with Saint Kilda Brew (@SaintKildaBrew) at the Middle Park Hotel (@MiddleParkHotel). It was great to return the favour and show off some of Manly’s gems. Rory participated in those evenings with gusto and was grateful for seeing Manly after spending his working day at Parramatta. Welcome lads. Good to see some interstate bonding via the BotF. Cheers, great to finally be inducted. 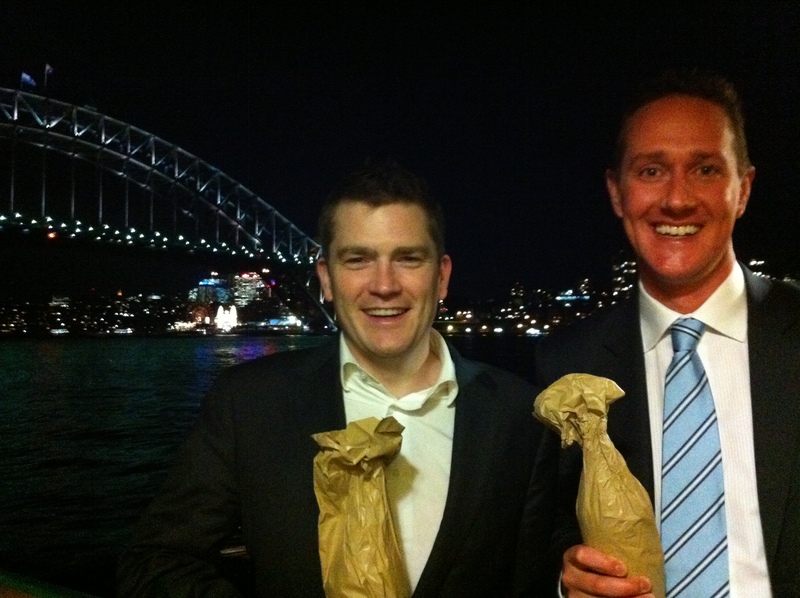 BotF a special experience – look forward to many more trips… Should’ve taken 2 long necks though. Newbie error. Cam, long time no see and there you are drinking beer on the back of the ferry! You’re in Melbourne now? You coming along to Good Beer Week? I’ll be there showcasing our latest Italian beer imports.